The Association of National Sports Governing Bodies (ANSGB) held their General Assembly Meeting at the CedarBridge Academy. Delegates representing Bermuda Boxing Association, Bermuda Association of Motorsports, Bermuda Badminton Association, Bermuda Basketball Association, Bermuda Bicycle Association, Bermuda Body Building and Fitness Federation, Bermuda Bowling Federation, Bermuda Cricket Board, Bermuda Darts Association, Bermuda Equestrian Federation, Bermuda Fencing Federation, Bermuda Football Association, Bermuda Gymnastics Association, Bermuda Hockey Association, Bermuda National Athletics Association, Bermuda Netball Association, Bermuda Powerboat Association, Bermuda Rowing Association, Bermuda Rugby Football Union, Bermuda Sanshou Association, Bermuda Squash Racquets Association, Bermuda target Shooting Association, Bermuda Triathlon Association, Bermuda Volleyball Association and Special Olympics Bermuda met during this bi-annual meeting to hear and discuss sporting matters. 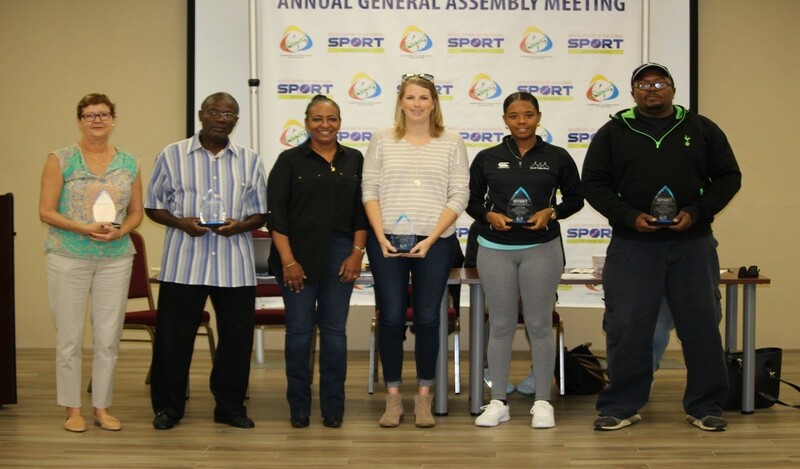 “Under this banner we are framing our presentations and discussions as well as recognizing those individuals who have selflessly given their energy for the advancement of sporting Bermuda and the wider community,” Dunne said. Minister of Labour, Community Affairs and Sports Lovitta Foggo expressed her admiration for the work that sports does in the community saying, “I’m sure all of you can appreciate the great impact that sports has on a community. The meeting commenced with the ANSGB Volunteer Recognition Awards presented in conjunction with the Department of Youth, Sport and Recreation. The Award was created as a token of appreciation to any person or organization who has served their sport of affiliation or sport generally in an exemplary manner in a strictly voluntary capacity, while demonstrating commitment and by upholding the image and integrity of sports through tireless and at times personal sacrifice. The awardees for 2018 were Timothy Trott for 30 years of service to Basketball, Elka Gibbs for 15 years of service to Equestrian, Gladwin Ford for 50+ years of service to football, David Crofts for 3 years of service to Rugby and Martin Bolton for 25 years of service to Cycling.